Remember that scene in "Tommy Boy" when they are in the car trying to sing "It's the End of the World" by REM but neither of them actually know the words so one of them changes the radio channel and on comes a Carpenter song. They both eye each other sheepishly, "You can change it if you want". "No, you go ahead and change it". And the next thing we see is both of them screaming "Don't you remember you told me you love me baby..." to the song on the radio while tears roll from their eyes. It's a classic scene if you haven't seen the movie. So fast forward to the other day in the car and I'm screaming out the words to "Very Last Day" by Peter, Paul and Mary with the volume cranked way up while the wifey-poo sinks down in her seat hoping nobody pulls up beside us at the light. Now this isn't just a folk song, this practically a gospel song about the Judgement Day. I'm not even religious and yet I just love to belt out that song. It's not one I can just listen to. I know...its highly embarrassing. And that's just it, isn't it? We all secretly like or sing these songs that we probably wouldn't admit to. I grew up listening to some odd music that I find comforting to listen to now. The album "Aladdin" by Rotary Connection is likely one very few have heard and yet I know exactly one side of that album by heart. I happened to find it out on Amazon one day and got the digital version....just for me. Another obscure band I know well is "It's a Beautiful Day". 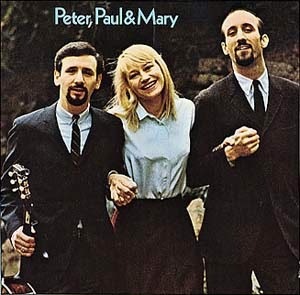 Peter, Paul and Mary was always playing at our house when I was a kid. And I'm so familiar with those songs that I used to sing them to my kids to go to sleep when they were young. They love them...and as such, they've now got memories of those very same songs; whether it is Stewball the racehorse, the Lemon Tree, Puff the Magic Dragon or more obscure ones like Rocky Road. And then it occurred to me. What is the one word you can change to the main chorus of this song to turn into a much different kind of song? So...fess up...what do you secretly sing or listen to when nobody is around? I now have 'Bad Bad Leroy Brown' lyrics circling my brain. Nice! I love me some Peter, Paul, and Mary. I need to check out some of those more obscure songs, though.